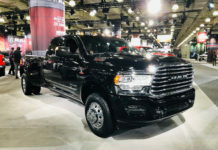 Home News 2019 RAM 1500 Sport: Can Full-Size Trucks Be Pretty? 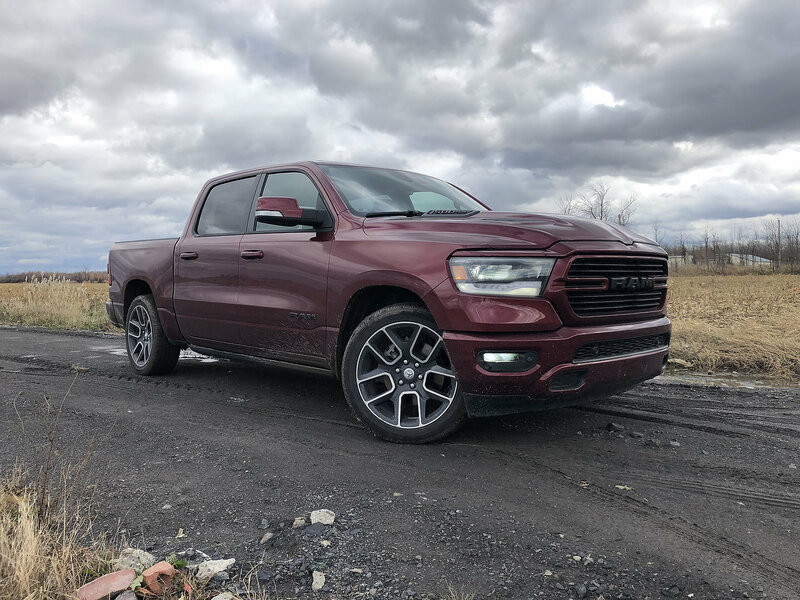 2019 RAM 1500 Sport: Can Full-Size Trucks Be Pretty? I’m dead serious! 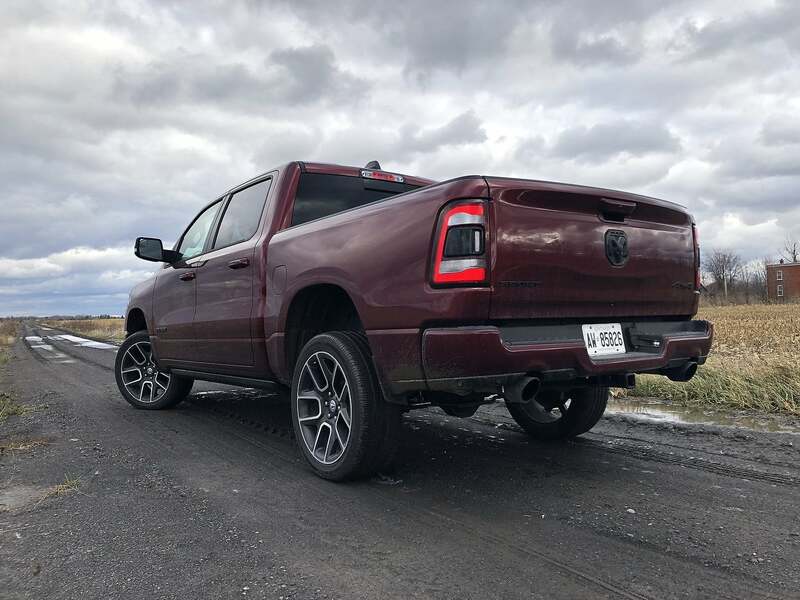 Twice now I’ve caught myself staring lovingly at the damned 2019 RAM, running my eyes over its bulging hood, swept-back sharp headlights, toned and muscular haunches and its massive rear tailpipes… I feel like I should report myself to the authorities. 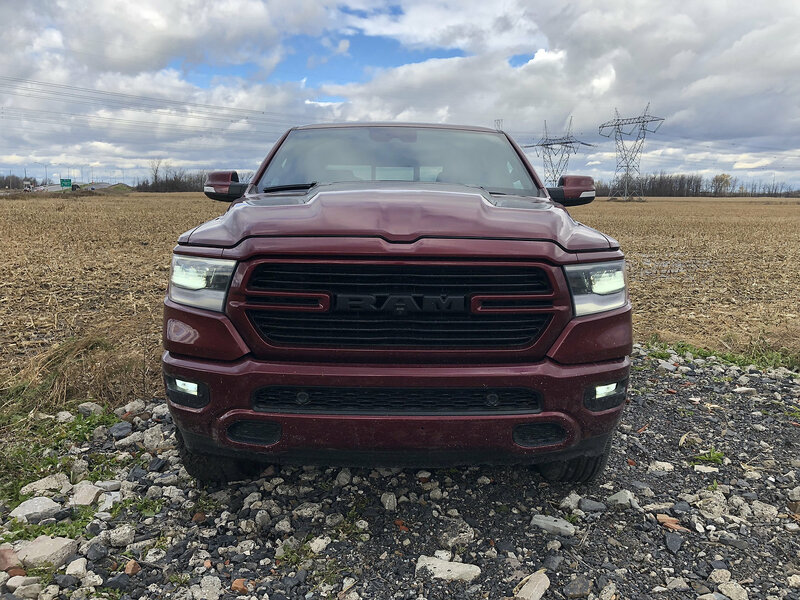 It’s full-size trucks like the 2019 RAM 1500 that are doing damage to many a luxury car category. Not that long ago, these trucks were nothing more than a cab, a box and some wheels. 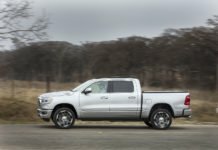 While classic trucks like a late-50s Chevy Apache are sublime, from the 60s to the early 90s, most pickups were nothing more than useful tools. That all changed in 1993. We all remember the 1996 movie Twister for two reasons: Helen Hunt and the Dodge RAM. 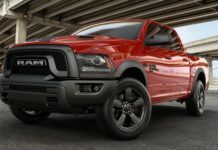 At the time, the then Dodge RAM had been on the road for about two years and already it was a monster success. The feature-length film catapulted the truck into stardom, at least in my mind, and became the hottest large truck ever. That design evolved over the next 25 years but never did quite knock my socks off, much like Helen TBH, as its done this time around. By comparison, the GM twins looks like they’re trying too hard – the Chevy’s grille seems to have oddly-placed dimples, which don’t work either. The Ford F-150’s handsome, but no more than that. 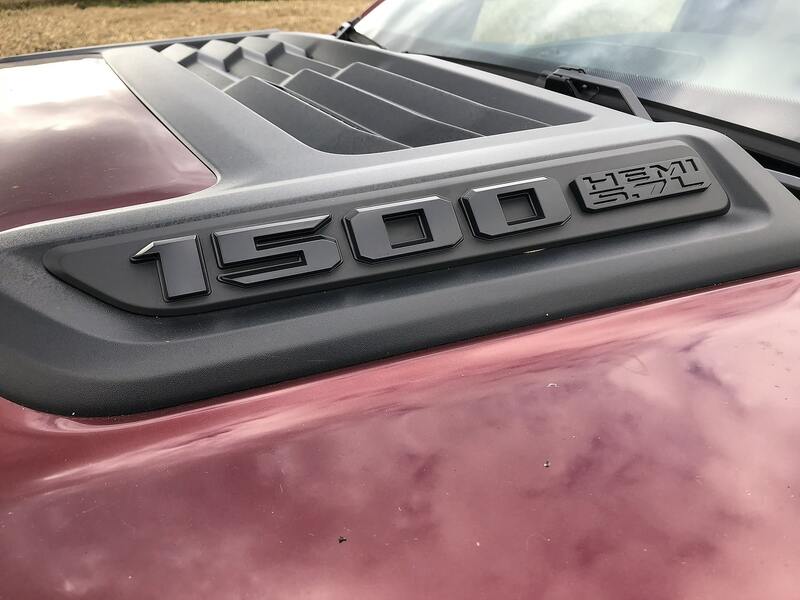 RAM designers and engineers did not stop at the chiseled body. They decided to fully shove it in the competition’s face. 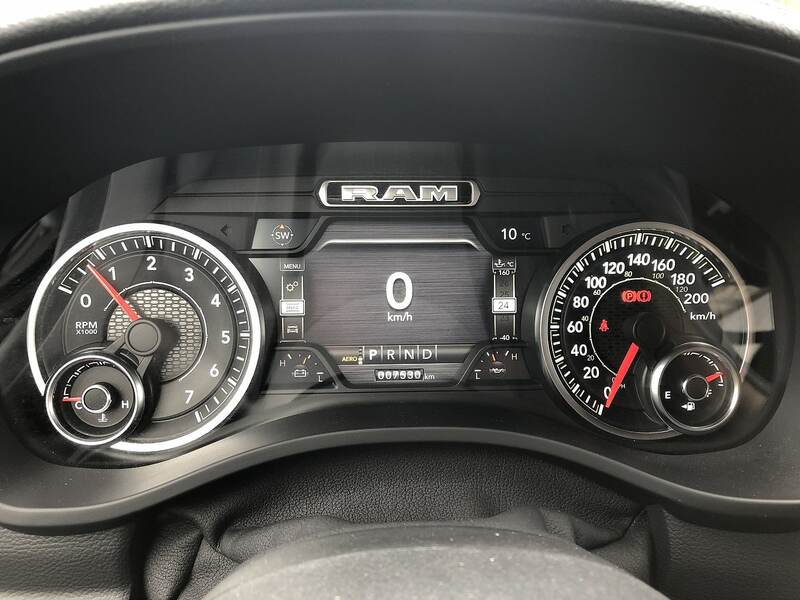 My Sport tester is only the third trim of seven but by the looks of the dashboard, the materials and attention to detail, you’d swear this was top-line Limited. These trucks don’t come cheap however. 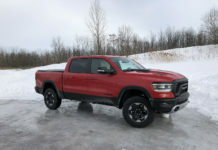 Base price is $55,000 and as tested, equipped with the Level II equipment group, panoramic sunroof, 22-inch wheels and 4-corner air suspension, the grand total is of $74,000. 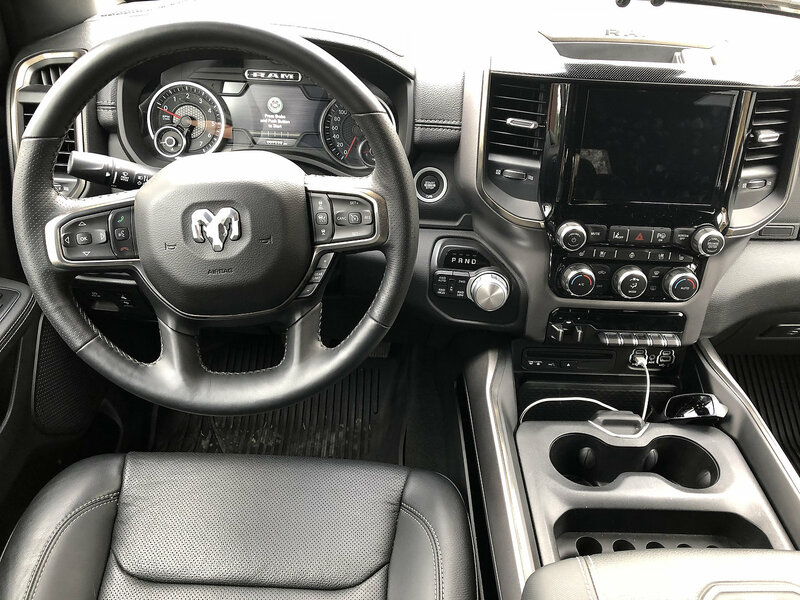 A fully optioned out Limited will set you back over $90k – but oh what a RAM it will be! 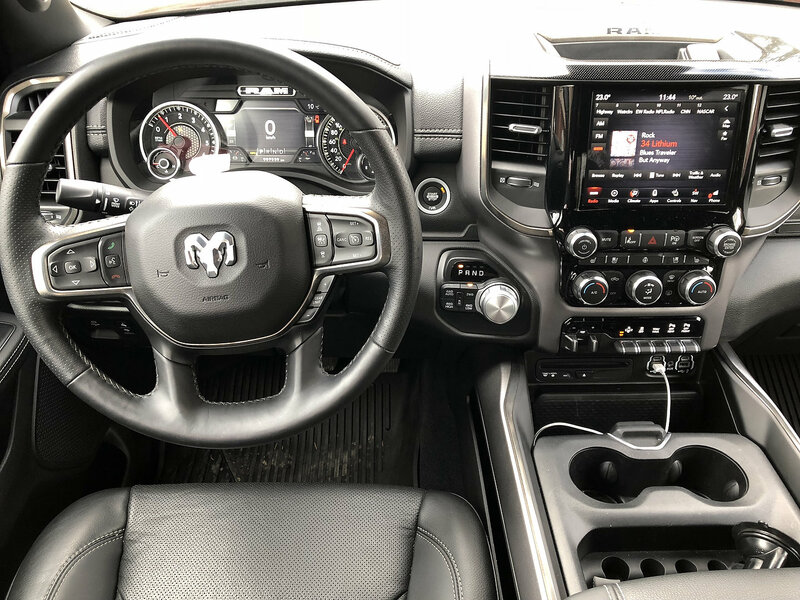 The instrument panel, heck everything, is sweet glossy, touch-y feel-y goodness, loaded with style with only one exception: the shifter wheel. It looks out of place, and almost too dainty. 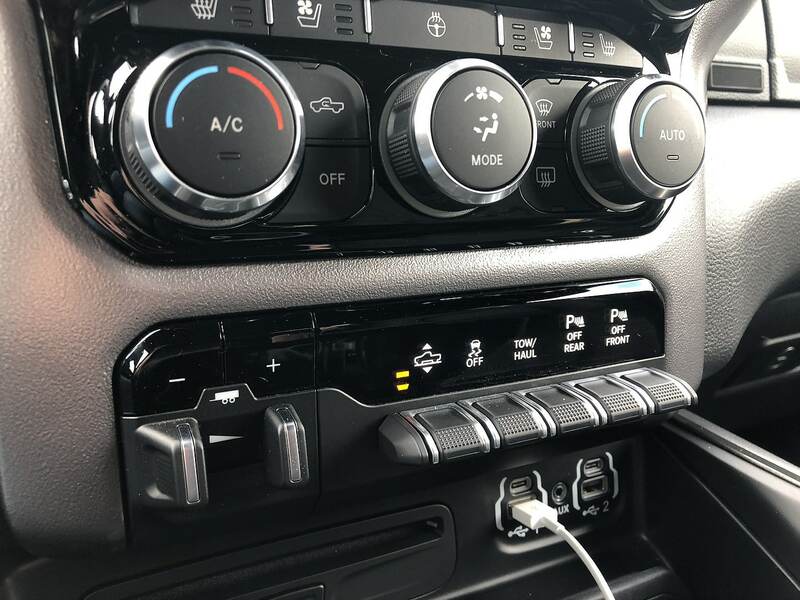 Yes, the lot of switchgear is elegant but there’s nothing manly about turning a wheel to “D”… I’d say nothing beats a column shifter but I’d suggest a “P” button (or pushing on the wheel for “P”) could help. 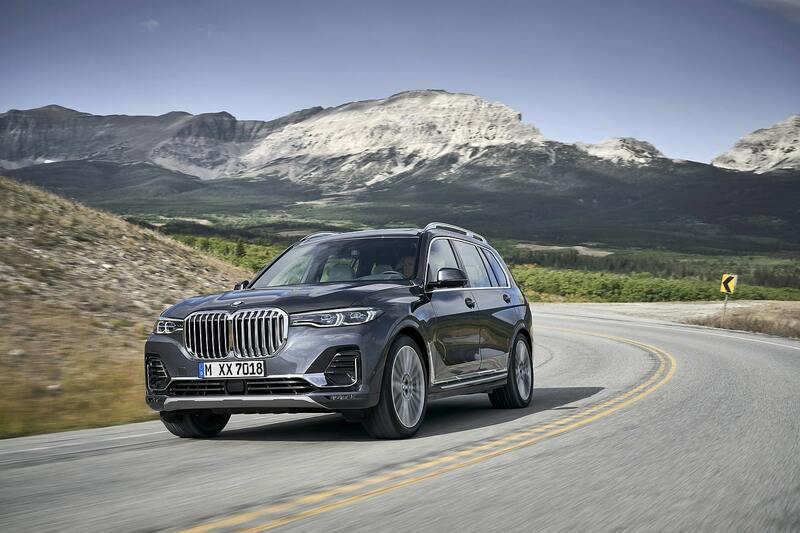 Luxury cars no longer hold any secrets or special tech – all manners of cars and trucks are privy to it now. 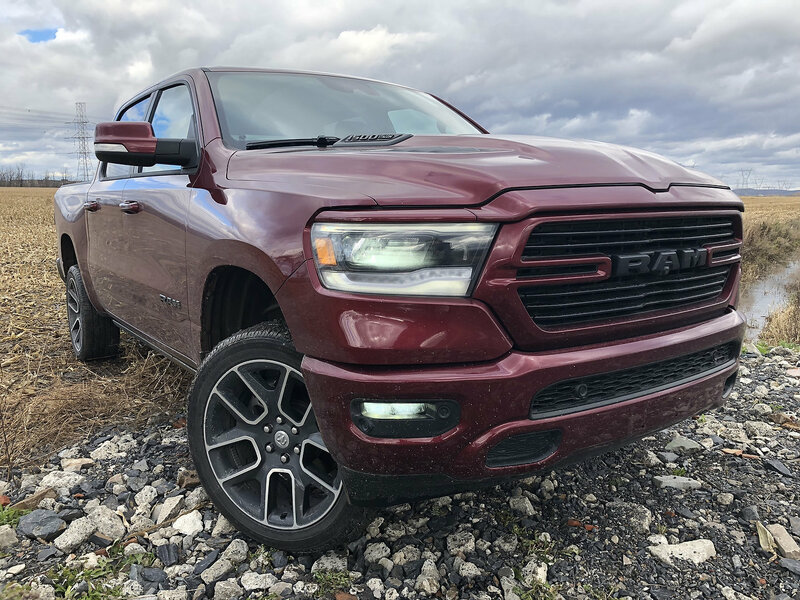 This 2019 RAM 1500’s got it all. Actually, almost all. The standard screen is an 8.4-inch unit which can be upgraded to a 12-inch depending on trims and options. What’s absolutely best about the RAM (and some other vehicles too, really) is the redundancy of certain controls. The moment I start the truck, I can active the heated wheels and increase cab temp without waiting for a dang screen to load. If I want to use the uConnect panel, I can as well. Interior room is phenomenal, for five giants adults too! 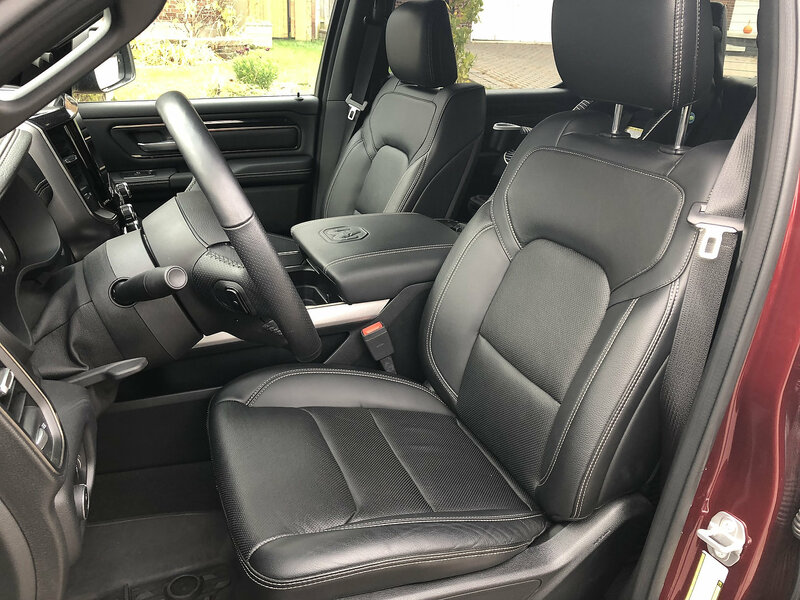 The front seats are huge and comfy and I must say that the driving position is blameless, if mostly because the steering wheel has reasonably-sized spokes! 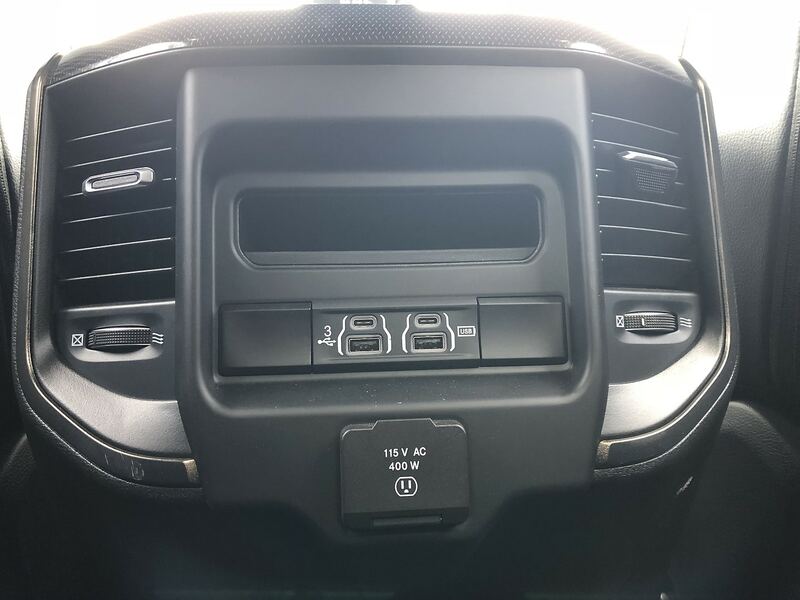 And just below the right-hand spoke is where you’ll find the transmission gear control button. Let’s talk about the powertrain for a second, or for the next five minutes. So far for 2019, there’ are only two offered engines. 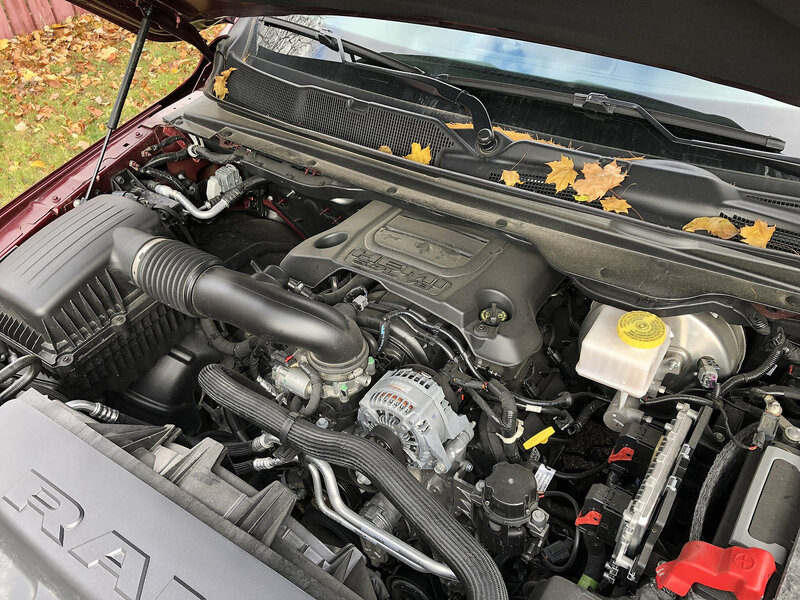 The first is the 3.6-litre Pentastar V6 engine with eTorque torque technology. 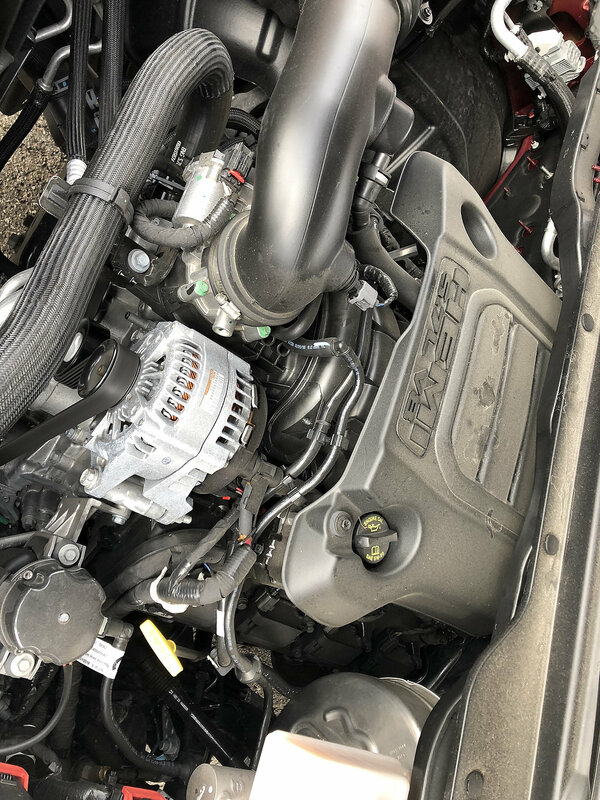 eTorque is a mild-hybrid system that provides an extra power boost when needed without the use of fuel. The other is the HEMI. The 5.7-litre V8 returns better and smoother than ever. 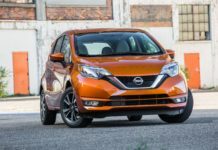 It produces 395-horsepower and 410 lb.-ft. of torque that have never felt healthier, or more alive. 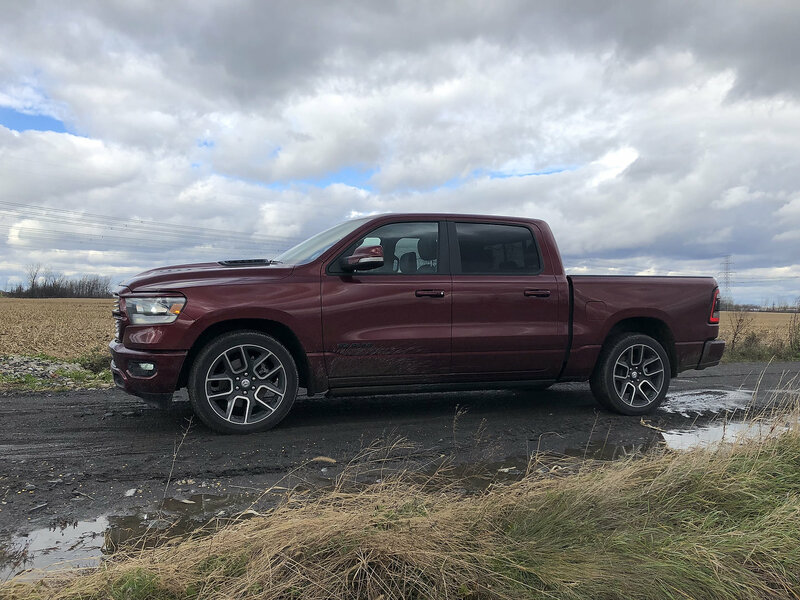 The standard 8-speed automatic transmission is part and parcel to how good the RAM 1500 feels moving forward. 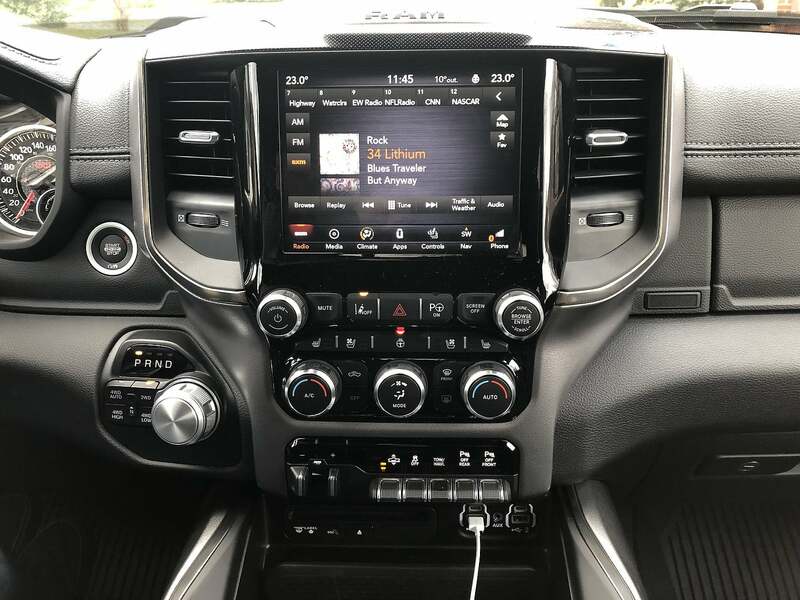 The wheel-mounted buttons I referred too are gear lock-outs for towing, or off-roading – these are the only reasons to be manually involved with the transmission. 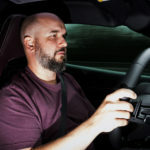 In normal drive cycles, the ‘box smoothly glides from gear to gear but when the desire for V8 power surfaces, mostly for the bellow in my case, it’ll drop everything else it’s doing and pound away. Truthfully, there exists a tiny delay between foot-drop and response but in the real world, it’s all good. 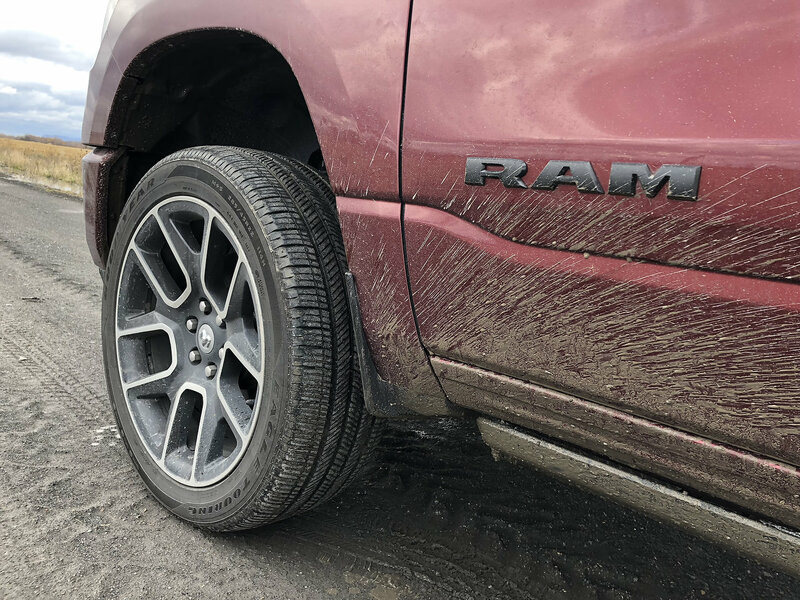 No matter the trim, RAM offers buyers the opportunity to select the 4-corner air suspension as an option. If you’re getting your RAM to replace your old E Class Mercedes, get it. Spend the $1,895 and enjoy it. If you’re towing or hauling lotsa loads, I’m not so sure it’s the right thing to do, however – it’s shown not to be the most reliable in the past. 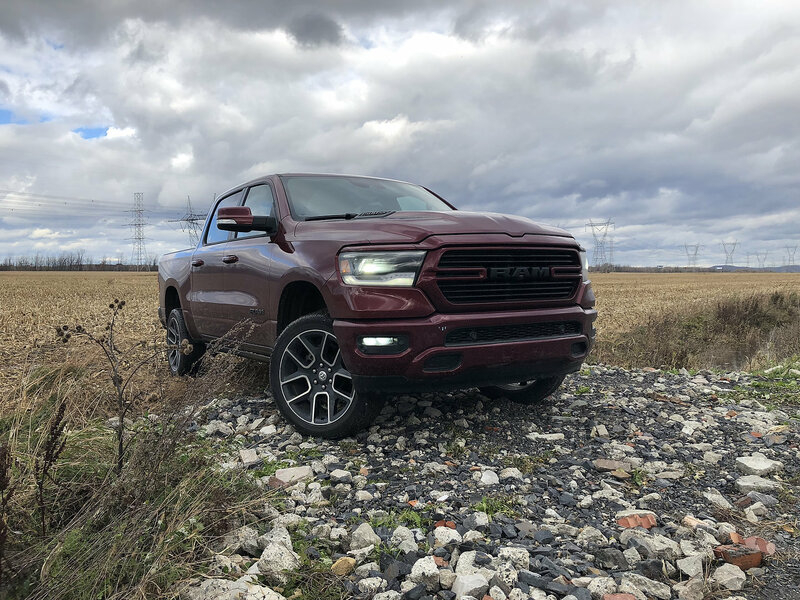 On the road, the RAM with air is nearly as plush as can be expected from a full-size pickup that can still tow over 8,000 lbs. 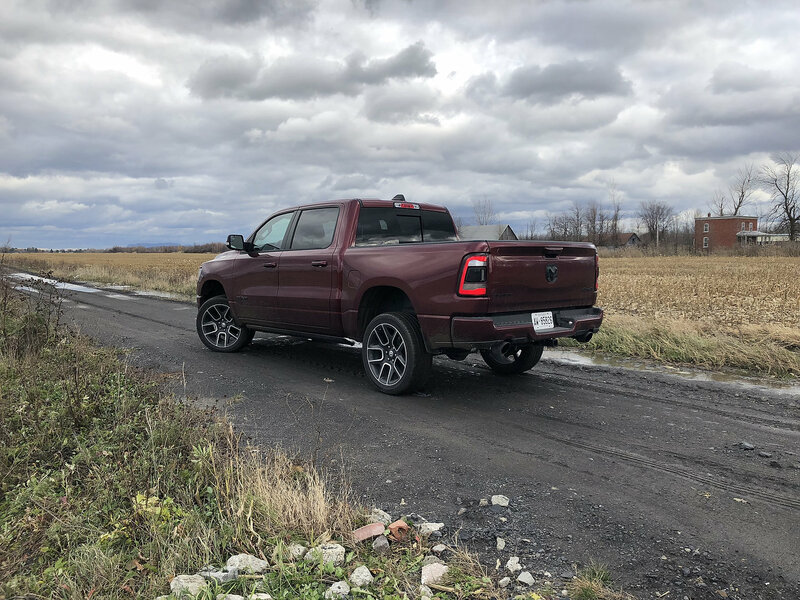 Steering is well adjusted, brakes are strong and the HEMI is, well, thirsty… I managed no better than 18L/100 km over the week-long drive and even if you’re careful, don’t think you’ll drop that far below 16L. 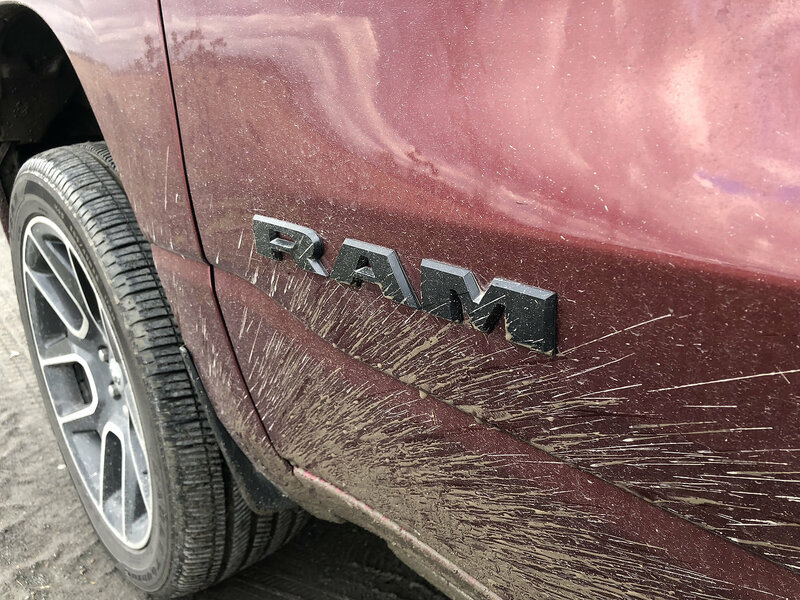 The RAM is, dare I say it, fun to drive. 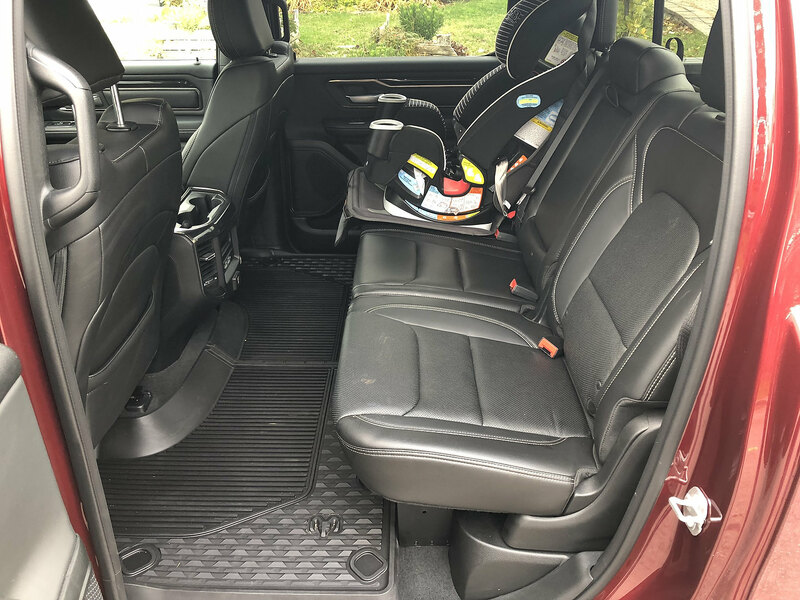 The well-isolated cabin, loads of power and room, not to mention luxury amenities including the available power running boards, make it an ideal daily driver, for everyone and everything. 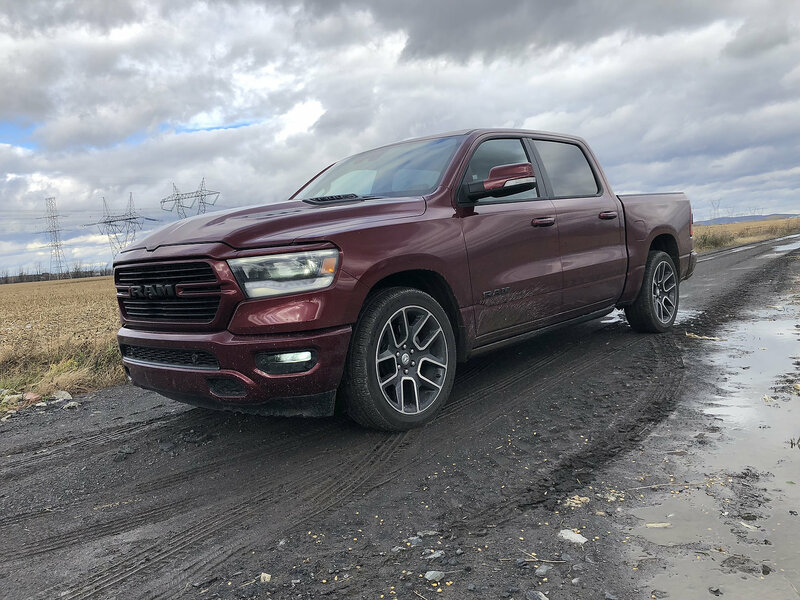 The takeaway from the new 2019 RAM 1500 is that it we’ve reached a point in the automotive world where off-roading and working capabilities do not exclude refinement, luxury and technology. 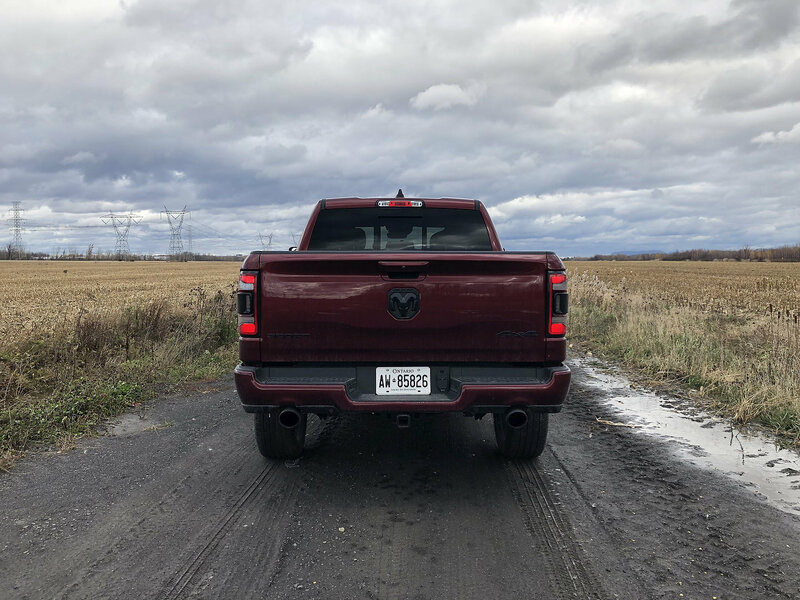 This is the case with all the latest full-size pickups from Ford and GM as well but I’ll be damned if any of them give me all the fizzes like the RAM does.